Harm de Blij - author, professor, and television personality - will speak to our audience. Born in the Netherlands, de Blij is a geographer who has brought his remarkable insight to ABC's "Good Morning America," NBC News, and PBS' "The Power of Place." 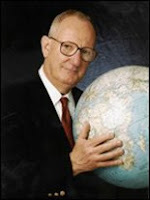 He specializes in geopolitical and environmental issues and is the author of more than 30 books and over 100 articles. His most recent book, "Why Geography Matters," argues that America's persistent geographic illiteracy constitutes a national security risk. Come and broaden your horizons and your view of our world.